Photo courtesy of Dave Scholz. An If killed my great-great-grandpa during the civil war, the miserable coward. WANTED: If and When, spotted shop rifting. Give you much reward. No ifs, ands or buts allow. If I catch that if, I’m gonna give him one heck of a coopelation. ten thousand yens. Two bucks and a quarter. Only ¥ 10,000? Still, I apprecite the gestule. 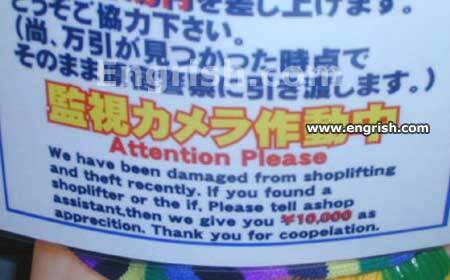 A man showed that sign to the shop keeper a week later – he made 20,000 yen. Wait, is that Japanese Yen or Chinese Yuan? Cause that’d either be 100 or 1500 US dollars. These things are good to know before someone turns into a rat.